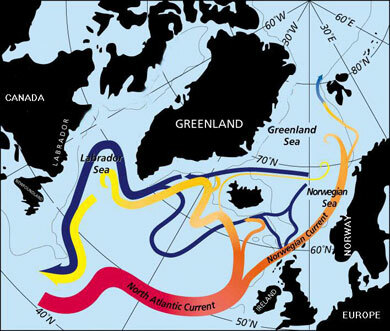 Web of Science: What would happen if the North Atlantic Current should stop or change direction? What would happen if the North Atlantic Current should stop or change direction? In its present state, the North Atlantic Current carries warm sea water and thus heat from equatorial latitudes all the way north to the Barent Sea and Arctic Ocean. En route, it releases warmth into the atmosphere from its surface layer. This means that the sea in the North Atlantic is relatively warm and the weather in Western Europe and Iceland is mild in relation to the latitude, much milder than regions at similar latitudes in the North Pacific or on the east coast of America. Research during the past decades has shown that the North Atlantic Current has changed in geohistorical times. Sea temperatures today are estimated to be 7 °C higher than in the ice age and air temperature is 10 °C higher. Drill cores from the Greenland ice cap and cores from sea bed sediment have been used to conclude that fluctuations between warm and cold periods during an ice age are caused by changes in the sea currents in the North Atlantic, particularly with relation to the process called Thermohaline Circulation, THC. Most surface currents in oceans are related to prevailing air currents at the oceans' surface, while the thermohaline circulation has an influence to great depths, also on deep currents. Thermohaline circulation is a global ocean circulation where relatively warm saline water flows north via the North Atlantic (the Gulf Stream) and transfers heat to the atmosphere. This process cools the sea water, causing its density to increase and so the sea sinks and finally becomes deep sea, particularly in the Greenland Sea (between Jan Mayen og Spitzbergen), Labrador Sea (between Greenland and Labrador) and Irminger Sea (between Iceland and Greenland, south west of Iceland). This shows the circulation of the North Atlantic Current. For the sea to reach the great density required for it to become deep-sea water, the the surface sea water has to maintain high salinity. Deep-sea water that forms in the northern oceans, flows south over the ridge between Greenland and Iceland, Iceland and the Faroes, and between the Faroes and Scotland. The deep sea current goes south via the Atlantic and its effects are discernible all the way to the North Pacific. This circulation is sometimes compared to a conveyor belt that pulls warm surface sea water north via the Atlantic, because sea is needed to replace the sea that has sunk. The global capacity of this system is thought to be about 16-20 Sv, where Sv is a unit of ocean current flow, 1 Sv = 1 million m3/s (million cubic metres per second). So global thermohaline circulation in the oceans is closely related to Atlantic weather, which is in turn sensitive to changes that result from the steadily increasing greenhouse effects in the world's atmosphere and global warming. One consideration is that faster melting of the glaciers and of sea ice could reduce the salinity of the surface water, thus lessening or inhibiting the formation of deep-sea water, which would lead to smaller currents of warm sea to the north and thus colder weather in the regions influenced by the North Atlantic Current. The rate of change is an important factor. Climatic changes are said to be rapid if they take decades or a few centuries, such as the changes observed in the drill cores from the Greenland ice cap. The last fluctuation was about 10,000 years ago, and marked the end of the ice age. This question actually deals with the major issue of the era, not only in the domains of oceanography and meteorology, but also reaching into economics and sociology. The international academic community emphasises the need to learn more about thermohaline circulation, particularly about the factors that cause it to increase or diminish. One way is to enter knowledge into calculation models and predict the interaction of air and sea and developments given different sets of conditions. Given the likely future increase in carbon dioxide in the atmosphere, the results produced by many models show a decrease in North Atlantic Current volume of the order of 20-30%. Though this should be taken with the caveat that many aspects of these models are subject to criticism, the models will improve when the algorithms and the computers become more powerful, coupled with improvements in the data they are fed with. Actual measurements in the ocean are now indicating that there is a reduction in the deep sea flow to the south in the submarine pass between Scotland and the Faroes. But better and more detailed measurements are necessary to confirm this and to effectively monitor the deep sea flow from the northern seas. Maybe the person asking the question has seen the film The Day After Tomorrow which deals with changes that occurred in the North Atlantic Current and in thermohaline circulation. The hero, Jack Hall, shows typical illustrations of thermohaline circulation and of the "conveyor belt" at a conference in New Delhi. The films shows disasters resulting from calamitous climatic changes that take place in a few days! In true Hollywood tradition, the two hour film had to be packed with action, but some of the phenomena, such as the tidal wave and the super storm, do not have a basis in scientific reality. But there is no reason to belittle this film. It should make the audience dwell on the fact that man is changing the earth's climate, in a way that may change sea currents in the North Atlantic. Though the global average temperature may rise as a whole, some areas will become cooler and climatic changes may in some respects take us by surprise. Jón Ólafsson. „What would happen if the North Atlantic Current should stop or change direction?“. The Icelandic Web of Science 9.12.2005. http://why.is/svar.php?id=5470. (Skoðað 21.4.2019).